America's withdrawal from the "Iran deal" doesn't prove that Iran is a threat to world peace and stability - instead - it proves that America cannot be trusted. But the president threatened that he could still ultimately pull out of the deal. The agreement regarded Iran’s nuclear technology program, seeking assurances from Tehran that its use of nuclear technology would remain peaceful – and in turn – pressure placed on Iran both politically and economically – particularly economic sanctions – would be reduced. While the argument stands that Western nations already possessing nuclear weapons, coercing non-nuclear nations to abandon ambitions to acquire parity – while Western forces occupy and ravage nations both east and west of Iran’s borders is as hypocritical as it is unjust – the deal itself was nothing more than a means to advance – not hinder or reduce – Western aggression versus Iran. President Trump’s announcement fulfilled nearly a decade-long ploy to draw Iran into what US policymakers as early as 2009 called a “superb offer” designed solely to portray the US as having tried diplomacy before changing tack toward more direct economic, political, and military aggression. In a 2009 report titled, “Which Path to Persia? : Options for a New American Strategy Toward Iran” (PDF), corporate-financier funded US policy think tank the Brookings Institution would explicitly call for a deal to be offered by the US to Iran only to be intentionally broken and used as a pretext for direct military confrontation. The exactitude by which this 2009 policy has been executed – transcending two US presidencies – and leading precisely to the edge of an impending US-Iranian confrontation in the Middle East already being fought out in proxy across Syria, Iraq, and some may argue, Yemen – should leave no doubts as to what happens next. US troops are now operating all along Iran’s so-called “arc of influence” across the Middle East – thanks in part to the self-proclaimed “Islamic State” (ISIS) and America’s alleged efforts to combat it. As was predicted at the onset of ISIS’ entrance into the conflict, the US has used the terrorist organization’s presence across the region to justify its initial and now expanding occupation of Syria and its continued interference in Iraq. However, what the US has done instead of actually fighting ISIS – from Syria to Iraq – is divide and weaken Iran’s regional allies – dragging them into a protracted and destructive conflict, exhausting their numbers and taxing their logistical and economic underpinnings. At the same time – however – they have created the circumstances in which Russia has intervened directly and on a scale eclipsing and complicating US involvement in both terms of diplomatic legitimacy and in terms of military force. With Kurdish factions receiving US support and attempting to carve out territory straddling the Syrian-Iraqi border – also under the guise of “fighting” ISIS – the US and its partners are now attempting to introduce a new narrative – that Kurdish independence is under threat not by ISIS, but by Iranian-backed armies on both sides of the border. 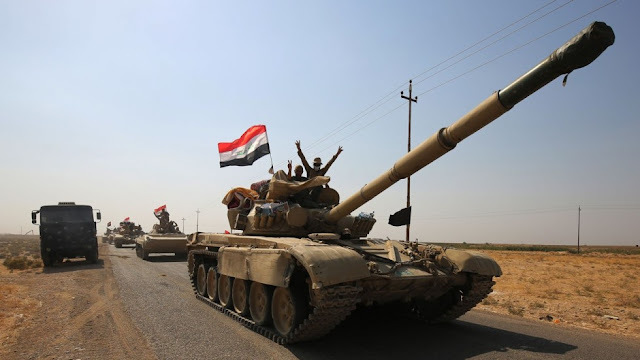 Recent security operations carried out by the Iraqi government in taking back its northern city of Kirkuk from a US-backed Kurdish occupation conjured up headlines across the West implying that Baghdad and its Iranian backers were seizing Kurdish territory, though most articles bury admissions toward the end of them that much of this territory was indeed seized first by Kurdish militants under the guise of fighting ISIS. [Iraqi Prime Minister Haider al Abadi] had the option of acquiescing and agreeing to negotiate Iraqi Kurdistan’s long-term future, or refusing to accept the challenge it presented to Iraq’s integrity. He chose the latter, no doubt under pressure from pro-Iranian Shia militia leaders who have long warned that Kirkuk is a red line. Kurdish officials have always expected that post-ISIS larger conflicts would erupt. One senior commander told CNN two years ago that ISIS was no more than an irritant to the Kurds. What they really feared was expansionist Shia militia, well equipped and funded by Iran. Here, CNN attempts to sell a narrative that will effectively shift America’s justification for remaining involved in the Middle East from fighting a now defeated ISIS to confronting Iran. The city and its surroundings have long been a diverse area comprising Kurds, Arabs and Turkmen. Kurds returned to Kirkuk in huge numbers after the overthrow of Saddam Hussein, and further entrenched their control in 2014 when repelling ISIS advances. It is an admission that lays bare as a lie the narrative that Kirkuk is somehow “Kurdish” – a lie intentionally perpetuated to justify a Balkanized region and continued US interference across it. Iraqi security operations – if ultimately successful – set a precedent that may be duplicated in Syria – where Kurdish factions with US-backing are openly and overwhelmingly confronted and rolled back when the timing is right – depriving the US of what it had hoped would become a “safe zone” from which it could continue its dissection of the Middle East and its proxy war on Iran and more indirectly, on Russia. Key in Iraq’s initial success in retaking Kirkuk is not exclusively its support from Iranian-backed militias, but from Kurdish factions themselves – illustrating the lack of unity among Kurdish groups in fulfilling Washington’s ambitions – and perhaps an opportunity for both Baghdad and Damascus to strike a mutually beneficial deal that would maintain the territorial integrity of both states and provide peace and stability everyone in the region would benefit from, including the more realistic factions among the Kurds. 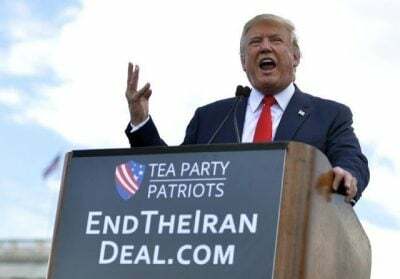 Despite this tenuous footing the United States now finds itself on, the prospect of the US and its regional partners launching a desperate last-ditch military assault on Iran cannot be ruled out. Declining hegemons rarely exit with grace and the US is no exception. In many ways, the destructive, brutal 6 year conflict that has consumed Syria and Iraq is the manifestation of America’s ungraceful refusal to accept a permanently shifting paradigm both in the Middle East and across the globe. Should Iran and its allies across the region and around the world continue patiently and intelligently confounding and confronting American hegemony in the Middle East, it will continue to wane until it ultimately evaporates. As the US backtracks on the Iran deal – exposing the fact that US policymakers never planned on honoring it in the first place and only ever saw it as a means of justifying conflict rather than preventing it – helps further undermine US efforts to perpetuate the devastating war it has engineered across the region. Exposing the US as the primary factor driving conflict in the Middle East rather than an essential broker for achieving peace, is the first of many necessary steps required toward achieving real, actual, and enduring peace.